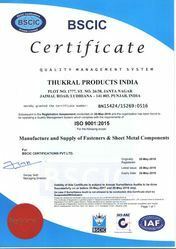 Established in the year 1986, we, “Thukral Products India” is a prominent Manufacturer and Exporter engaged in offering Split Pins, R Pins, Dowel Pins, Linch Pins, Circlips, Spring Washers, Star Washers, Plain Washers, Bearing Locks, Anchor Fasteners, Automobile Fasteners in all sizes and materials. Our presented products are valued by the clients for their precision quality and durability. We are related with an extensive vendor base, which ensures that the products are invented using quality tested steel at their erudite production unit. We inspect these products at our excellence control lab for ensuring their acquiescence with the business norms and standards. With the provision of our knowledgeable professionals, we are capable to supply these superior quality products to the patrons as per their demands. We guarantee that the products are shipped to the clients within the specified time frame. Additional, our uprightness and transparency in dealings have assisted us in winning the faith of the patrons. Mr. Sukhchain Singh, our supervisory inspiration is the one who we look up to, when a demanding condition crops up. He essays the part of our mentor with greatest finesse and stimulates us to scale newer statures of success. We are reinforced by a team of highly capable and brilliant specialists, which has years of experience in their particular sphere. These professionals are well-versed with all the hypothetical & applied surfaces of industry. Our specialists are hired after examining their acquaintance and experience of the industry. Additionally, they work in a close ensemble with each other as well as customers in order to comprehend and accomplish their exact demand in the least conceivable time.